The perfect lunch, snack or even breakfast and very child friendly – marathopites (μαραθόπιτες) use only the leaves or frilly fronds that grow on thin stalks above the fennel bulb. Here in the Northeast US its often difficult to find fennel bulbs with a beautiful bushy bunch of fronds attached as they’re usually trimmed for supermarket shelves. They can, truth be told, get a bit unruly. 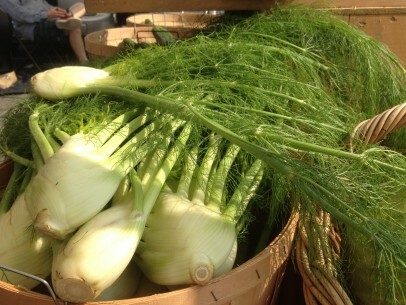 Then comes July at the farmers market and fennel is at every stall, displayed in all her leafy glory. This is the time to make, eat and freeze for non-fennel seasons, marathopites! I like to begin this recipe by making the filling. You can make the filling up to 3 days ahead of time, kept covered/refrigerated, until ready to fill your pites. Start by cutting the stalks from the fennel bulb, then snip off the fennel fronds/leaves from their stems and chop them quite finely. Add these to a medium size bowl and then add whatever additional greens (I love spinach) and herbs (mint and parsley are my favorites here), all chopped fine. Remember to make sure to wash all your greens and herbs WELL – especially if they’re from your garden or farmers market – to make sure there won’t be any dirt or grit showing up in your pites! Chop onions well and set aside in a small, separate bowl. Saute the onions over low heat until soft and almost translucent. 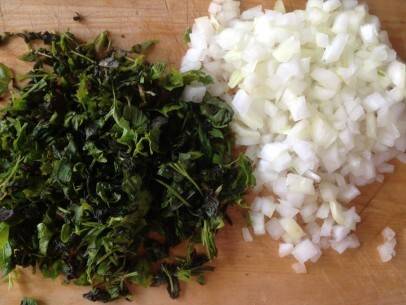 Add the fennel fronds/leaves, greens, herbs and salt and stir everything to combine over low heat for 5 minutes. You want to just release the oils and aromas of the fennel and herbs and wilt the greens, not cook them. Set aside and make your dough. The dough is quick and simple. 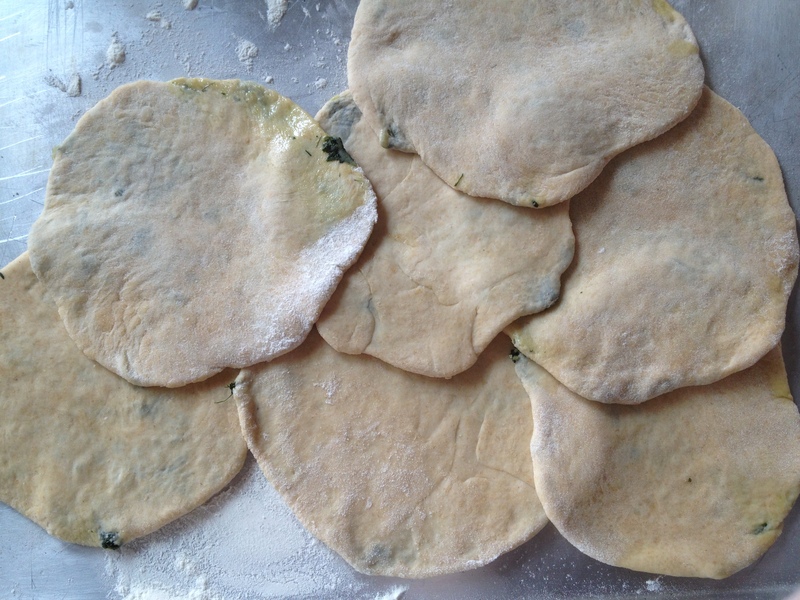 A few basic ingredients – flour, water, vinegar, salt and olive oil. Mix everything together and knead into a smooth ball of dough. I like to use the dough right away and not refrigerate for later. It mixes up in less than 5 minutes so really no need to make ahead. You can use all purpose flour but I recommend you combine AP with at least 1/2 whole wheat. I love King Arthur’s Organic White Whole Wheat and it works very well in this recipe. This gives your dough a bit more umph and helps to make sure the filling doesn’t come popping out of your pites! This next part goes very quickly once you get the first couple started. I’ve outlined the steps in detail and you’ll get the hang of it in no time at all, I promise. For a 6′ diameter pita, I use a 1/3 cup measuring scoop of dough pinched off of the whole ball. Roll each scoop into a small ball on a floured surface. You should get about 12-14 balls. Flour your rolling pin and roll out each ball into a thin circle. Add approx 1 rounded tablespoon of fennel filling to the center of each circle. Gently pinch up the sides of your circle so that you end up with a little bundle. 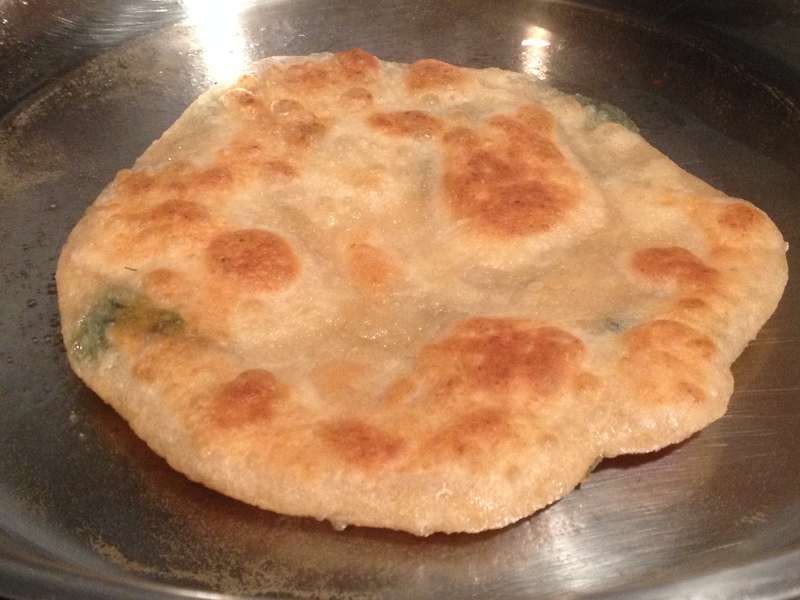 Take each bundle and gently punch down the sides into the center so that you have a fat pancake of filled dough. Then, again with a floured rolling pin, carefully roll out the fat pancake of filled dough into a very flat circle once more. Make sure not to do this too quickly or strongly, a light hand is the trick here! If any filling or oil leaks out onto your rolling surface, simply wipe away and re-flour surface between pancakes. Roll out all of your filled bundles and collect on a baking sheet. Now your pites are ready to either freeze (with sheets of parchment paper between pancakes) or fry and enjoy right away. 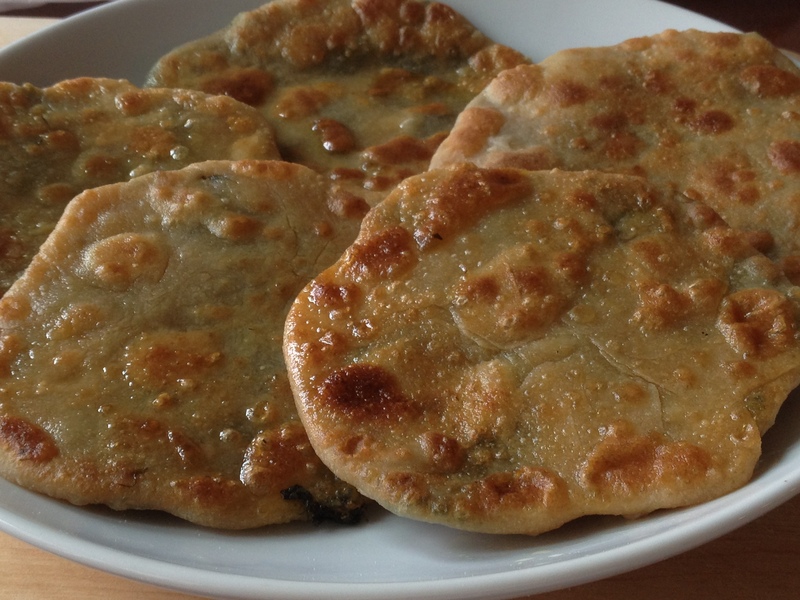 This recipe makes dough and filling enough for 1 dozen, 6″ diameter pites and can be scaled as many times as you need. I’ve made up to ten batches at a time – just make sure you have a bowl big enough to mix up that much dough! Feel free to ask if you can just purchase the fronds/leaves and leave the fennel bulbs behind if you’re making a bit batch or marathopites as it becomes tricky what to do with all that fennel bulb – just something to consider! 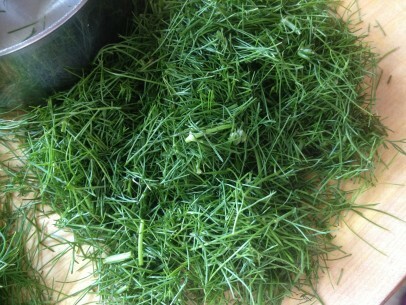 Cut the stalks from the fennel bulb, then snip off the fennel fronds/leaves from their stems and chop them very finely. 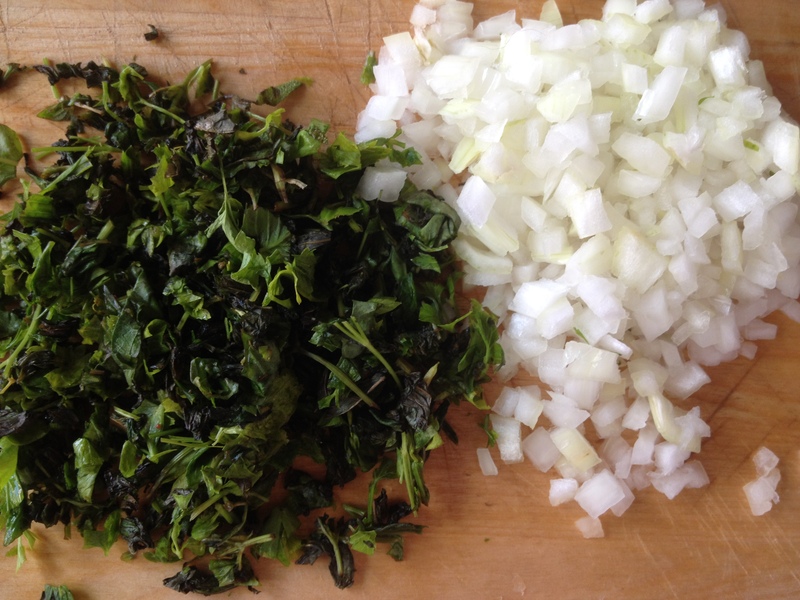 Add these to a medium size bowl and then add whatever additional greens and fresh herbs, all chopped fine. Chop onion to a fine mince and set aside in a small, separate bowl. Sauté the onions over low heat until soft and almost translucent. Add the fennel fronds/leaves, greens, herbs and salt to the pan. Stir well to combine all ingredients and warm filling over low heat for just 5 minutes to release the oils and aromas of the fennel and herbs and wilt the greens, not cook them. Set aside. In a large bowl, mix dough dry ingredients well to combine and add remaining ingredients, stirring until ball forms. 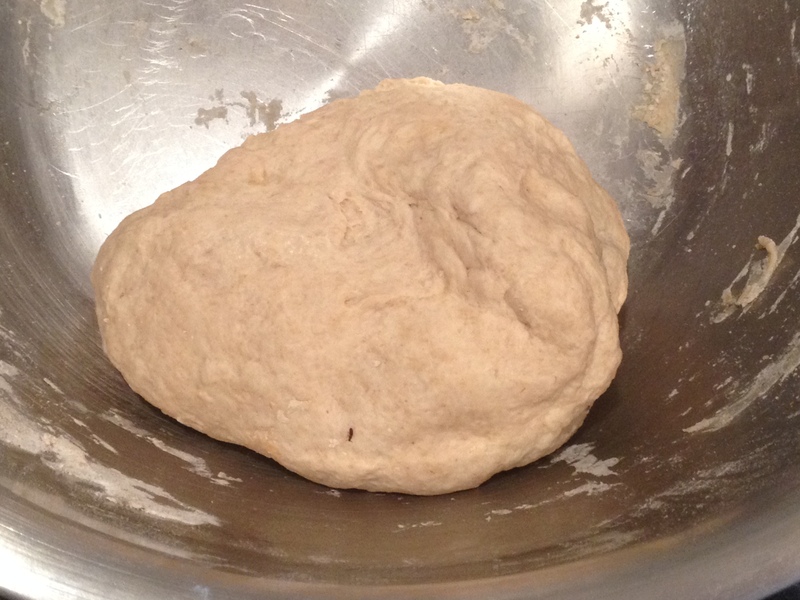 Knead for about 4-5 minutes until ball becomes smooth. Use a 1/3 cup measuring scoop of dough pinched off of the whole piece. Roll each scoop into a ball on a floured surface. 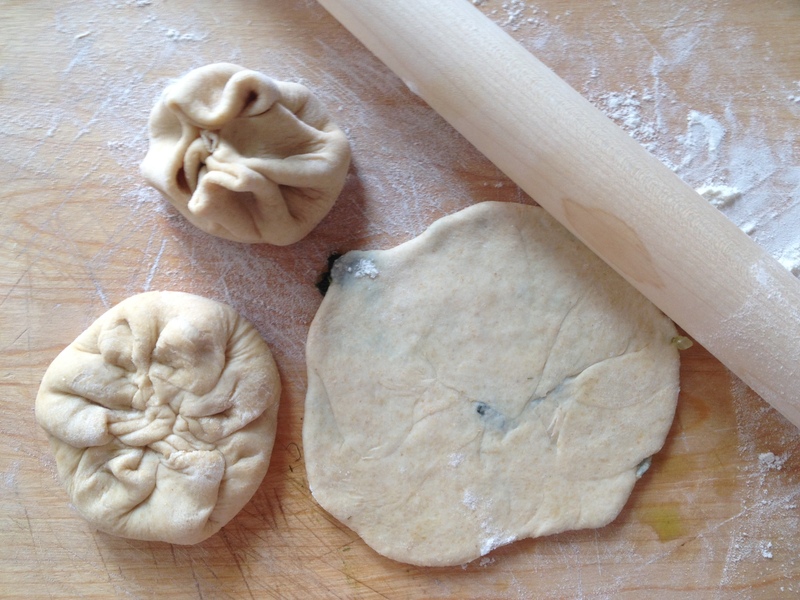 Flour your rolling pin and roll out each ball into a thin circle. 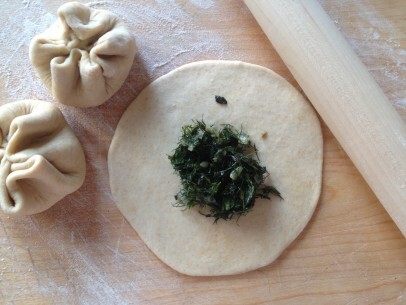 Add approx 1 rounded tablespoon of fennel filling to the center of each circle. Gently pinch up the sides of your circle so that you end up with a little bundle. 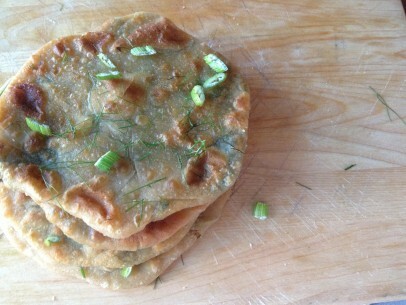 Gently punch down the sides of each bundle into the center so that you have a fat pancake of filled dough. Then, again with a floured rolling pin, carefully roll out the fat pancake of filled dough into a very flat circle once again. Roll out all of your filled bundles and collect on a baking sheet. Now they’re ready to either freeze with with sheets of parchment paper between pancakes or fry immediately. Brush each pita with olive oil as it comes out of the pan. Garnish with chopped fennel fronds/leaves and chopped thin fennel stalks. Enjoy warm or at room temperature. hot out of the pan and brushed with olive oil – delicious! Hi there! I stumbled upon your site, and as a born and bred Greek, I have to say that they are simply amazing! If I may ask, from which part of Greece do you hail from?